One of the most popular web programming technologies is ASP.NET web forms, which binds data to controls. Developer Extensions for Microsoft Dynamics CRM 2015 has a number of mechanisms that make it easy to build an ASP.NET web form that binds to Microsoft Dynamics CRM data. The recommended practice for using Developer Extensions for Microsoft Dynamics CRM 2015 is to run the CrmSvcUtil.exe code generation tool, with the Microsoft.Xrm.Client.CodeGeneration extension, to generate the service context and data transfer object classes that match your Microsoft Dynamics CRM entity model. The service context class includes an IQueryable interface for every CRM entity in your solution. The service context class can easily be used with the ASP.NET LinqDataSource control to facilitate declarative data-binding that doesn’t need any code-behind. 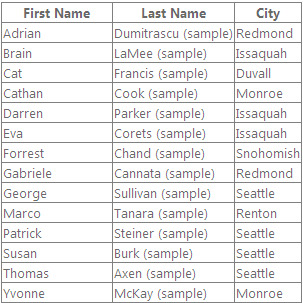 You set the ContextTypeName attribute of the LinqDataSource control to the type name of your service context and set the TableName attribute to the property name of the entity that you want to query. After the Microsoft Dynamics CRM data is bound to the data source control, you can use any ASP.NET data bound control to extract and display the data including repeaters and the GridView control. The following code uses a LinqDataSource control to bind to the CRM contacts and display them with a GridView. This same example can be seen in Walkthrough: Build a web application that connects to Microsoft Dynamics CRM using developer extensions. This shows the following results in HTML. If you don’t want to use the CrmSvcUtil.exe tool to generate a domain context and data transfer object, you can use the Microsoft.Xrm.Client.CrmOrganizationServiceContext. The following example uses FetchXml to query Microsoft Dynamics CRM and the CrmDataSource control to bind to CRM data. The results are displayed in a GridView control. 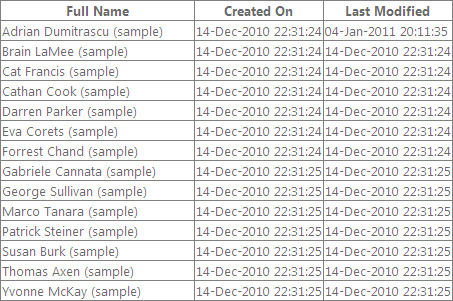 Note that the DataItem in the grid view is of type Entity. To bind to columns in the results, you can either cast the Container.DataItem to a Entity class or you can bind to the properties in the default indexer by using Eval("[attribute-logical-name]"). The CrmMetadataDataSource control allows for data binding to Microsoft Dynamics CRM metadata. The most useful purpose is to bind a drop-down list to a CRM option set that you use in a data form that is collecting data to store in CRM. The following example demonstrates using the CrmMetadataDataSource control to bind to three separate option sets in the CRM case (incident) entity. The previous examples used specific data source controls that implement declarative data binding. The XrmServiceContext class can also be used with data binding using code-behind techniques. The service context that is generated by the CrmSvcUtil.exe tool (with the Microsoft.Xrm.Client.CodeGeneration extension) has IQueryable properties for all CRM entities. You can write standard .NET Language-Integrated Query (LINQ) queries or use expressions with these properties and bind them directly to your repeaters or DataGrid controls. Microsoft Dynamics CRM has the ability to allow the customer to save a query or a view for later retrieval. 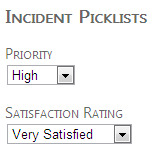 The view has column order and definitions, sorting order, and filter options. It is a convenient technique to allow users to configure a view in CRM and then a developer can use the SavedQueryDataSource control to bind to that view and use a GridView control with AutoGenerateColumns property turned on. This allows a developer to drop a CRM view directly into a webpage and have the view contents be managed in Microsoft Dynamics CRM. Business users can then change the contents of the view without having to work through a developer to make a webpage change and promote a new version of the website to the production server. For an example of this, as well as an example of how to generate a data entry form from a saved query using the CrmEntityFormView control, see Walkthrough: Build a web application that connects to Microsoft Dynamics CRM using developer extensions.